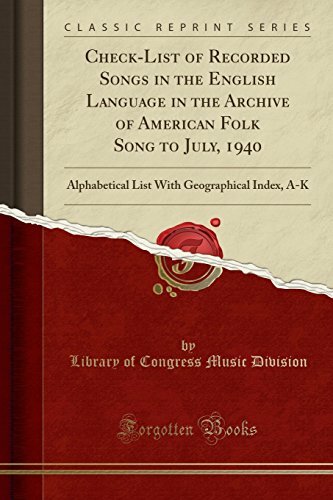 This checklist has been prepared as a result of the countless requests for such a catalog of the contents of the Archive of American Folk Song. Its appearance at this time is indeed appropriate since it is natural for a nation at War to try to evaluate and exploit to the fullest its own cultural heritage. In our folk song may be found some of the well springs of national feeling and many of the profoundest currents that have run through American history. A more glance at the titles listed here will be sufficient to show the variety and complexity of the demo cratic life of our country. The Library hopes that this catalog will prove useful to the many who are interested in utilizing the folkloris tic resources of our nation.